Passwords are one of the most often used authentication mechanisms employed today. It is important the passwords are strong and properly managed. If passwords are properly generated, updated, and kept secret, they can provide effective security. If a password generator is going to be used, the tools should create uncomplicated, pronounceable, nondictionary words to help users remember them so they aren’t tempted to write them down. If the users can choose their own passwords, the operating system should enforce certain password requirements. The operating system can require that a password contain a certain number of characters, unrelated to the user ID, include special characters, include upper-and lowercase letters, and not be easily guessable. The operating system can keep track of the passwords a specific user generates so as to ensure no passwords are reused. The users should also be forced to change their passwords periodically. All of these factors make it harder for an attacker to guess or obtain passwords within the environment. Electronic monitoring Listening to network traffic to capture information, especially when a user is sending her password to an authentication server. The password can be copied and reused by the attacker at another time, which is called a replay attack. Access the password file Usually done on the authentication server. The password file contains many users’ passwords and, if compromised, can be the source of a lot of damage. This file should be protected with access control mechanisms and encryption. Brute force attacks Performed with tools that cycle through many possible character, number, and symbol combinations to uncover a password. Dictionary attacks Files of thousands of words are compared to the user’s password until a match is found. Social engineering An attacker falsely convinces an individual that she has the necessary authorization to access specific resources. Rainbow table An attacker uses a table that contains all possible passwords already in a hash format. Certain techniques can be implemented to provide another layer of security for passwords and their use. After each successful logon, a message can be presented to a user indicating the date and time of the last successful logon, the location of this logon, and whether there were any unsuccessful logon attempts. This alerts the user to any suspicious activity and whether anyone has attempted to log on using his credentials. An administrator can set operating parameters that allow a certain number of failed logon attempts to be accepted before a user is locked out; this is a type of clipping level or threshold. The user can be locked out for five minutes or a full day after the threshold (or clipping level) has been exceeded. It depends on how the administrator configures this mechanism. An audit trail can also be used to track password usage and both successful and unsuccessful logon attempts. This audit information should include the date, time, user ID, and workstation the user logged in from. A password’s lifetime should be short but practical. Forcing a user to change a password on a more frequent basis provides more assurance that the password will not be guessed by an intruder. If the lifetime is too short, however, it causes unnecessary management overhead, and users may forget which password is active. A balance between protection and practicality must be decided upon and enforced. Password requirements, protection, and generation should be addressed in security-awareness programs so users understand what is expected of them, why they should protect their passwords, and how passwords can be stolen. Users should be an extension to a security team, not the opposition. Password Checkers: Several organizations test user-chosen passwords using tools that perform dictionary and/or brute force attacks to detect the weak passwords. If a tool is called a password checker, it is used by a security professional to test the strength of a password. If a tool is called a password cracker, it is usually used by a hacker; however, most of the time, these tools are one and the same. Password Hashing and Encryption In most situations, if an attacker sniffs your password from the network wire, she still has some work to do before she actually knows your password value because most systems hash the password with a hashing algorithm, commonly MD4 or MD5, to ensure passwords are not sent in cleartext. Salts are random values added to the encryption process to add more complexity and randomness. The more randomness entered into the encryption process, the harder it is for the bad guy to decrypt and uncover your password. The use of a salt means that the same password can be encrypted into several thousand different formats. This makes it much more difficult for an attacker to uncover the right format for your system. Password Aging Many systems enable administrators to set expiration dates for passwords, forcing users to change them at regular intervals. The system may also keep a list of the last five to ten passwords (password history) and not let the users revert back to previously used passwords. Limit Logon Attempts A threshold can be set to allow only a certain number of unsuccessful logon attempts. After the threshold is met, the user’s account can be locked for a period of time or indefinitely, which requires an administrator to manually unlock the account. This protects against dictionary and other exhaustive attacks that continually submit credentials until the right combination of username and password is discovered. Cognitive passwords are fact-or opinion-based information used to verify an individual’s identity. A user is enrolled by answering several questions based on her life experiences. Passwords can be hard for people to remember, but that same person will not likely forget her mother’s maiden name, favorite color, dog’s name, or the school she graduated from. After the enrollment process, the user can answer the questions asked of her to be authenticated instead of having to remember a password. This authentication process is best for a service the user does not use on a daily basis because it takes longer than other authentication mechanisms. This can work well for help-desk services. The user can be authenticated via cognitive means. This way, the person at the help desk can be sure he is talking to the right person, and the user in need of help does not need to remember a password that may be used once every three months. Authentication by knowledge means that a subject is authenticated based upon something she knows. This could be a PIN, password, passphrase, cognitive password, personal history information, or through the use of a CAPTCHA, which is the graphical representation of data. A CAPTCHA is a skewed representation of characteristics a person must enter to prove that the subject is a human and not an automated tool as in a software robot. A one-time password (OTP) is also called a dynamic password. It is used for authentication purposes and is only good once. One-time password generating tokens come in two general types: synchronous and asynchronous. The token device, or password generator, is usually a handheld device that has an LCD display and possibly a keypad. This hardware is separate from the computer the user is attempting to access. 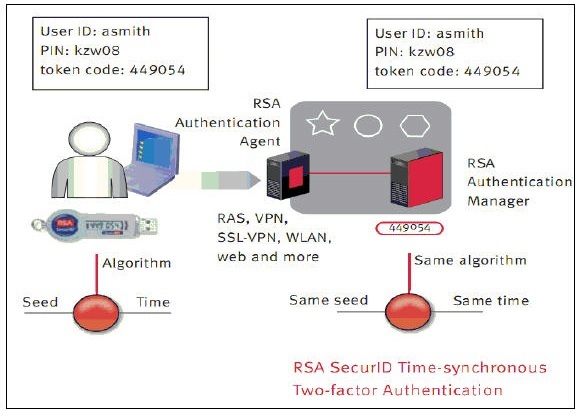 A synchronous token device synchronizes with the authentication service by using time or a counter as the core piece of the authentication process. If the synchronization is time-based, the token device and the authentication service must hold the same time within their internal clocks. The time value on the token device and a secret key are used to create the one-time password, which is displayed to the user. The user enters this value and a user ID into the computer, which then passes them to the server running the authentication service. The authentication service decrypts this value and compares it to the value it expected. If the two match, the user is authenticated and allowed to use the computer and resources. If the token device and authentication service use counter-synchronization, the user will need to initiate the creation of the one-time password by pushing a button on the token device. This causes the token device and the authentication service to advance to the next authentication value. This value and a base secret are hashed and displayed to the user. The user enters this resulting value along with a user ID to be authenticated. In either time-or counter-based synchronization, the token device and authentication service must share the same secret base key used for encryption and decryption. SecurID, from RSA Security, Inc., is one of the most widely used time-based tokens. One version of the product generates the one-time password by using a mathematical function on the time, date, and ID of the token card. Another version of the product requires a PIN to be entered into the token device. Asynchronous is based on challenge/response mechanisms, while synchronous is based on time-or counter-driven mechanisms. Both token systems can fall prey to masquerading if a user shares his identification information (ID or username) and the token device is shared or stolen. The token device can also have battery failure or other malfunctions that would stand in the way of a successful authentication. However, this type of system is not vulnerable to electronic eavesdropping, sniffing, or password guessing. If the user has to enter a password or PIN into the token device before it provides a one-time password, then strong authentication is in effect because it is using two factors—something the user knows (PIN) and something the user has (the token device). One-time passwords can also be generated in software, in which case a piece of hardware such as a token device is not required. These are referred to as soft tokens and require that the authentication service and application contain the same base secrets, which are used to generate the one-time passwords.